When Pom Wonderful asked me if I would like to review their product it look me all of 5 seconds to write back in the (ecstatic) affirmative. I love Pomegranates. When I went to school in Jerusalem, there was a pomegranate tree on my bedroom balcony. I ruined half of my tops eating fresh pomegranates off the tree. I LOVE POM Wonderful juice. Since I had such a huge quantity to work with, I started experimenting. My personal favorite was the Pom Shirley Temple. I make a lot of moctails, so I thought that Pomegranate juice might brighten up a regular Shirley Temple. I was very right. Just club soda, grenadine, POM juice and a maraschino cherry. Yum. The color was so elegant, it would be lovely for a party or shower. Lydia's favorite was the "Princess Drink. (See photo). 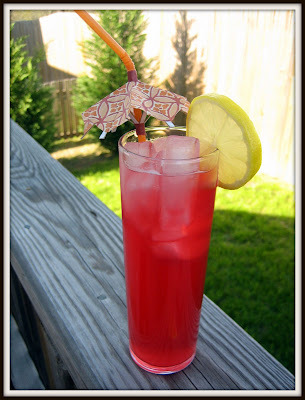 I like to make homemade lemonade, and adding POM juice made it all the better. I made the drink for myself, but when Lydia saw it, she looked at it with hands extended "Is that Princess drink for me?" Well, how can I deny her that? Thanks POM for the fantastic supply! I am totally hooked. To read up on more POM health facts, check here. I'm a lover of POM too! Yum! I'll have to try that - sounds yummy! 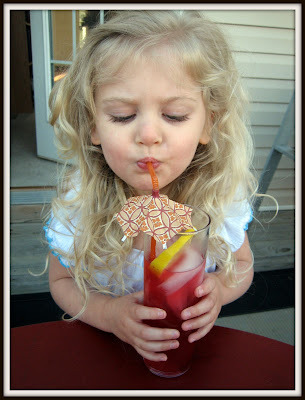 I have never had POM but that picture of her drinking her princess drink is sooo cute! I have never heard of this! Sounds great! Just stopping over from SITS and oh my goodness! Your daughter is so beautiful. I would kill for her hair.